I love game shows. No, let me amend that. I love intelligent game shows. Game shows where the contestant has to have at least a couple of brain cells to rub together in order to win a prize and not just jump up and down and act like they're about ready to have a seizure. Those kind of game shows I don't love. 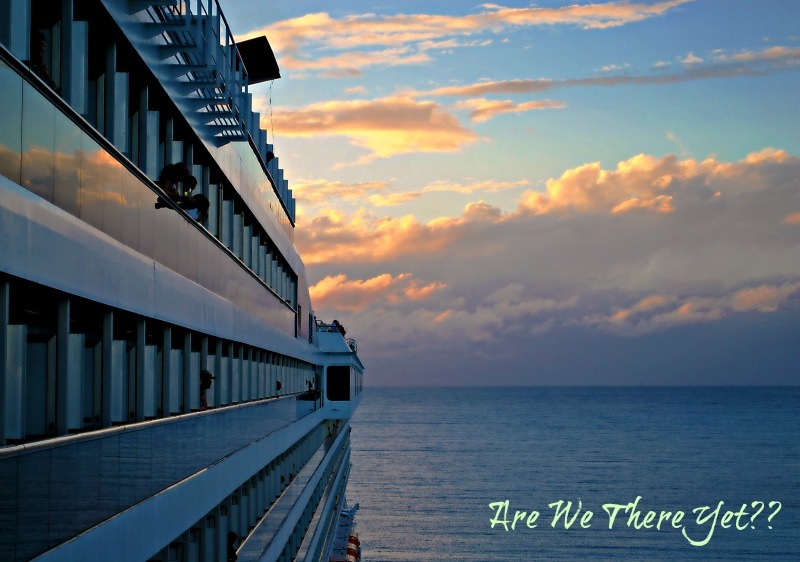 Those who are regular readers of this blog are probably aware of my futile attempts (groan!) to pass the audition test for Who Wants to Be a Millionaire - curses on Gwen Stefani and her b-a-n-a-n-a-s! I've made the trip down to New York City three times in order to allow myself the chance to feel like a complete and total dolt and chances are, I'll try it again one of these days as it's now become a challenge to prove to myself that - given enough tries - I could actually pass the test. Not that just passing the test gets you into the Hot Seat - there are several more hoops to jump through before that happens - but at least I could say I made it through the first hoop. Someday. Hopefully. Oh hey - wait! I know that one! It's avocados! I'm not sure if I even got half of the responses right so I'm certainly not going to hold my breath and wait for an invitation to attend the next round of the contestant search to be held in Boston, which would be the city closest to me. 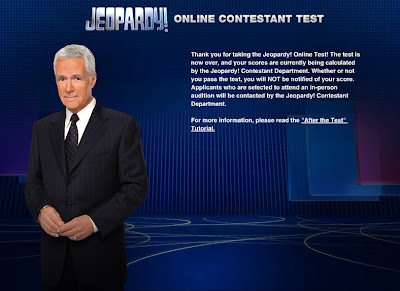 As a matter of fact, I'll never know how well I did or didn't do on the test as Jeopardy! never notifies wanna-be contestants whether they actually passed the test or not. Instead one just gets to sit home and beat his/her head against the dining room table while muttering "I'm so dumb, I'm so dumb, I'm so dumb" over and over again - which I guess beats telling oneself that on the 2-hour drive back from Manhattan! Ah well, hope springs eternal ... hmmm, I wonder when can I sign up to take the Millionaire test in New York City again?? which is bigger 1/2 or 1/4.... and the sad part was that she really didn't know! 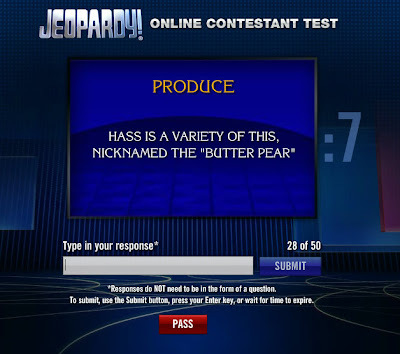 Good Grief I gave up as soon as I saw Buttered Pear.. yikes. I would be so rattled I would forget everything I knew... and I don't know much. You, Mo and Lois... amaze me most days. When put on the spot with a question in front of a group, I can't even tell you what my name is! No way would I ever go on a game show on TV. No way...No how. I hope you can make it some day. I would cheer you on! 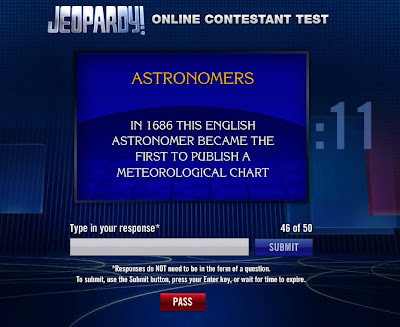 When we had television I never watched game shows, but I do know that I'm not smart enough for these questions. I certainly don't think you are dumb. You are one of the smartest people I know. I knew the Hass avocado question but that's it. I hope you make it on a game show someday, Duchess. That would be fab. Don't feel dumb. Not everyone has scads of obscure information ready to call up on cue. See? It's about information more than it is knowledge. You have to train your memory to store all kinds of things you read. I think you'd do fine with the pressure, given what you do for a living. LOL! I could probably come up with some of the answers for that test--if I had a half an hour to answer each one. ;) I'm always way too slow to answer even the few questions I do know on Jeopardy. Hmmm...if you could have Google open it might not be so bad. But, there's no way in H - E - double hockeysticks that I would even think about trying out for Jeopardy. Wheel of Fortune, maybe but not Jeopardy. I just don't do well under pressure anyway. I love those trivia shows, but I'm definitely not very good at them. You at least answered some of them, cause I am totally clueless here. The only game show I watch is Wheel of Fortune LOL! 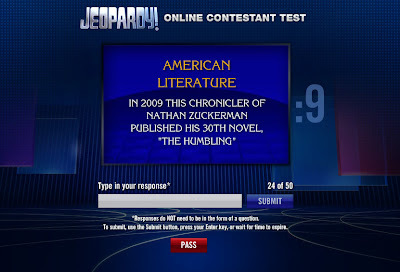 Well I knew the avocado and Halley as in Halley's Comet, but no dice on Zuckerman. We can all feel unschooled together. Hope you not only get on Millionaire but win it.